While Windows 8 has a lot of cool features to entice users, arguably, the coolest is Account sync. For those who choose to log in to their Windows 8 devices with a Microsoft account, Windows 8 can synchronize a ton of information from one device to the next. You can choose to sync everything from basic settings to themes and wallpapers. Windows 8.1 users can even sync modern applications between accounts. Imagine a world where you set up your account on one computer and it follows you around to every Windows 8 device you use. That world is here, provided you pick the right settings. On the right pane of the PC Settings window, you’ll find a number of options for you to select. Your first move should be to move the slider under “Sync settings on this PC” to the ON position. This enables the feature. Now you’ll have to choose what gets synced. Passwords – Includes passwords for some apps, websites, networks, and HomeGroup though this option is only available once you trust your PC on live.accounts.com. Next, you’ll have to choose whether or not you want to allow syncing over metered connections and, if so, when roaming. These settings matter quite a bit on mobile devices as syncing can cause you to incur data charges. If you select “No” you will only sync while connected to Wi-fi. For users of laptops and desktop computers, this setting doesn’t really matter. 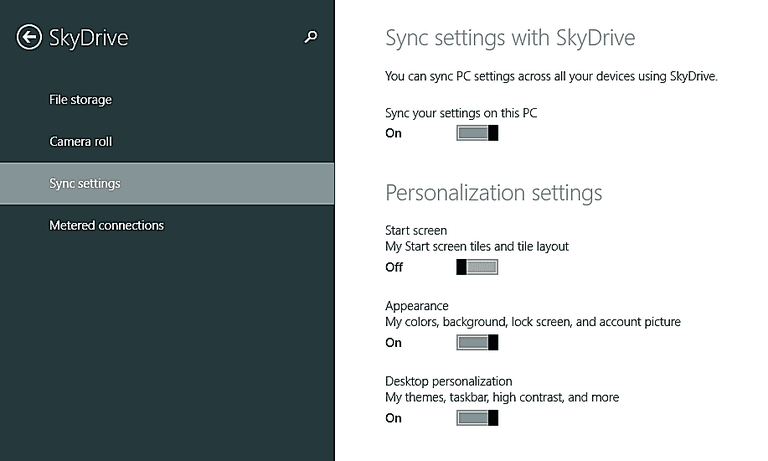 In Windows 8.1, users are given a few new options for data synchronization in their accounts. The settings have also been moved around as the Microsoft overhauled the PC Settings. Back up settings – Backs up all settings, even those that aren’t synced, to SkyDrive so that you can restore them to your computer if needed. Whether you’re running stock Windows 8 or you’ve upgraded to Windows 8.1, this account sync is a huge boon. It takes only a few minutes to set up and you’ll save a ton of time tweaking your accounts for every device you own. If you’ve got multiple Windows 8 computers, tablets or smartphones, you’ll definitely love this feature.